1. Perfect Match Gel Polish: this is the shade I have on my nails right now and I'm pretty sure it's my favorite gel color ever! This brand always lasts the longest for me too so I lean toward using it every time I go to my salon. Highly recommend this shade if you're due for a new color! 2. 'Beach Please' Baseball Hat: whether you're out running errands, haven't had time to do your hair or are in the sun, baseball hats are musts and these cute hats with says have been taking over this summer! I love this "beach please" cap and the price - only $15! 3. 'Always Happy Hour' Door Mat: I have an obsession with cute door mats like this! Perfect for summer and to stick outside when you have friends coming over. 4. Black Bow Slide Sandals: I chatted about these last week on Instagram and they were a huge hit! They're on sale right now for $18, so yes, you can totally buy two! ;) They're a perfect dupe for these Sam Edelman sandals and they come in quite a few colors. 5. Sunnies: you can never have too many sunnies come summer time, and at $12 they're the perfect pair to keep in the car or your bag for all of those times that you forget to grab ones from home! I love the shape of these and I'm not normally the type to go for circular frames, so if you feel the same way don't hesitate to buy these because they're great either way! 6. Tie-Dye Dip Tank: when I saw this in the store last week I fell in LOVE! Something about it is so fun and it's my favorite tank for the summer now. Fair warning - you definitely want to hand wash this and/or wash it alone (and in cold water!) the first few times so that the dye doesn't run. Some of the reviews warned that it ran, but I washed it the first time by hand and the second time alone in the washer in cold water and it was fine, #shoppersprotip? 8. Hawaiian Tropic After Sun Moisturizer: this is my holy grail product all summer long! If you haven't used this, you need to grab it - I put it on after my showers after being in the sun. It moisturizes your skin and has aloe in it so it's great for sunburn too! It's cooling to the touch and I kid you not, it has THE best scent in the world. I don't even know how to explain it, but it's heavenly! 10. Embroidered Wedges: these are pricey, but SO worth it. Embroidery is everywhere you look this season and they're one of those staple pieces you'll wear every once in a while and get tons of compliments each and every time! Definitely a splurge piece, but definitely a "need it" too! 11. Gemstone Earrings ℅: statement earrings can completely change the look of an outfit and these beauties do just that! 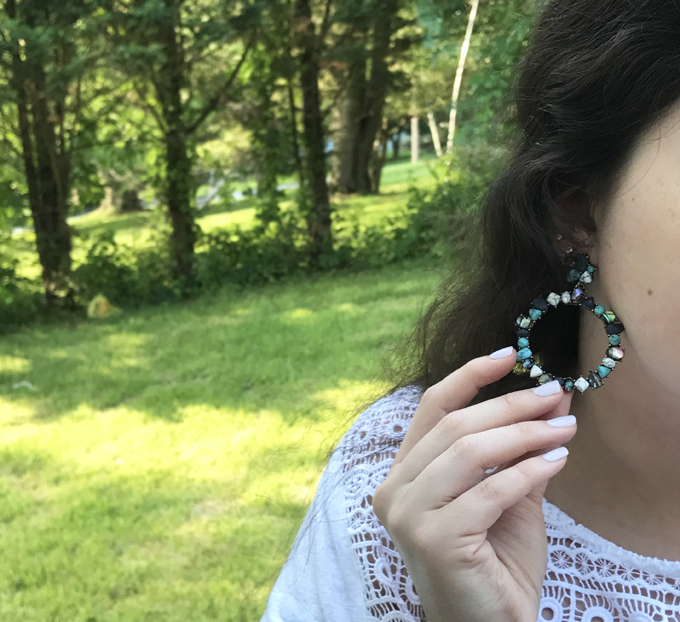 I was so excited when I saw these come in the mail from BaubleBar - the different colored gemstones are stunning and the blues and turquoise shades are great for summer. I love the way they look with a pretty summer white! 12. Woven Tory Burch Tote: SALE ALERT! This is over $200 off retail and it's the cutest summer tote! I lean toward smaller bags on a daily basis (especially in the summer) but traveling is always easier with totes and I love how summery this Tory tote is! It fits so much and it's extremely large inside, so if you're like me and like to grab a cute new splurge piece each season, this is a perfect option! 14. Striped Bow Hat: there's no such thing as too many fun summer hats! This one is $22 - perfect to take on a beach trip and the shape is very flattering on all sized heads. That's often a problem I find when hat shopping. 15. Pineapple Glass Markers: I grabbed these a month ago and they've been such a hit at all of my summer events so far! They're a simpler take on glass charms in my opinion and they're so easy to re-use. My friends have loved them! What a fun, Summery list! It makes me so sad that it's currently Winter here in Australia. This whole selection is adorable, but I'm especially feeling the baseball cap and those black slide sandals - so cute! That purse is super cute!I'm totally checking it out! I love nordstrom, they seem to be having alot of sales. They're actually not too bad! I have fairly sensitive ears so they're a little heavy on me, but not bad - my sister doesn't have sensitive ears at all and she says they don't feel heavy one bit! :) They're SOO cute in person - the pictures online don't do them justice!! That "beach please" cap is SO cute! I've been on the hunt for the one that says "bad hair day" but can't ever find it in stock! I have those bow sandals in 2 colors...THE best! Isn't it adorable?! OMG! That's so funny - I just found one at the outlet center near me the other day!! Here it is, it's only $19!!! - http://shopstyle.it/l/bYQR xoxo! 3, 4, 10, 12, 13 are all me! Love this thanks for sharing! You've got a fun style that could suit many people! I love those glass markers! They are adorable! And so are the wedges! I need that beach please hat! Perfect for summer. Great list! I'm loving that bow hat, too cute! 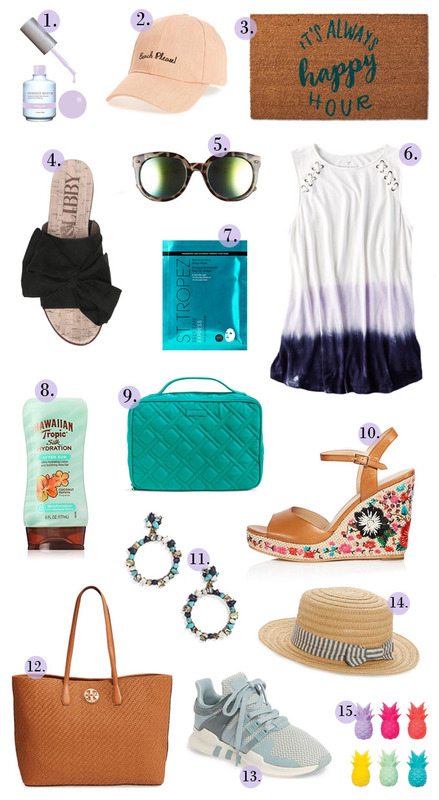 Definitely love those embroidered wedges and the Tory woven tote is so so cute for summer too! Great summer pics! Those embroidered wedges are to die for! Totally worth the price! Love the sandals and the cute welcome mat! St. Tropez is awesome and that doormat is super cute!! You picked such beautiful things! I love the wedges and the super cute pineapples! I'll take EVERYTHING! I've heard such great things about St. Tropez... and that doormat needs to be in front of my door! So cute, I love nordstrom and can't wait to shop their sale! uhhh i'll take one of everything!! seriously, i want them all! How cute are those glass markers. Need those. I love those sneakers!! That color is so cute! I love having colorful shoes to workout in! I have the pineapple glass markers and love them! Those shoes are amazing! Those wedges are too cute and those pineapple glass makers are awesome! I love St. Tropez products! They are my favorite brand of tanning! I'm crazy about bags. And that Tory Burch Tote is totally my style! THOSE WEDGES!! I need them in my life, asap. So pretty and perfect for summer! Seriously want everything you have picked out here! I love those embroidered Kate Spade wedges! Those embroidered wedges are GORGEOUS. I lovelovelove a good statement shoe!